Following the success of the Bluebonnet program for third through sixth grades, the Young Adult Round Table decided to investigate the creation of a state-wide reading incentive program for middle schools. Several Texas school districts already created programs for their middle schools, most notably Spring ISD’s Jackrabbit Award. YART chair Sandra Bull appointed Dr. Lesta Burt, a professor at Sam Houston State University, to chair the Ad Hoc Young Adult Reading Incentive Committee that would create a pilot middle school reading program. The committee chose to create a recommended reading list rather than an award. The first Lone Star list was presented at the 1990 Annual Conference. The pilot was considered a great success and was accepted by the TLA Executive Board as a standing committee in 1992. 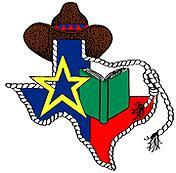 The distinctive Lone Star logo, consisting of a book and a star overlaying a Texas shaped flag, was created through a competition for sixth, seventh, and eighth graders. 1462 entries were received. Justin Macha, a seventh grader at George Junior High School in Lamar Consolidated School District, created the winning logo. Scholastic Books gave Justin a $500 savings bond and Econoclad Books presented framed copies of the logo to Justin and to the TLA headquarters. Committee members are chosen from a list of Young Adult Round Table Volunteers. Volunteer applications are available from April to October 1 each year.